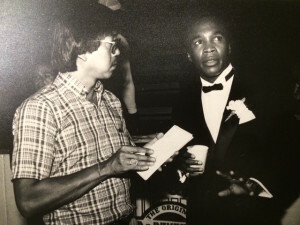 Al Young is an award-winning journalist who blazed many trails for Asian American sports journalists. He was the nation’s first Asian American sportswriter at a metro daily in the U.S. mainland. He was also the first Asian American to cover the NFL as a beat writer for the New York Giants and Jets. While with the New Haven (CT) Register, he wrote a weekly column that was the first in the country to focus on national and local personalities and trends in women’s sports. Young’s career spanned more than four decades. He was a writer and editor at the Boston Globe, USA Today, the New York Daily News, the New Haven Register and Bridgeport Post-Telegram. In 2010, AAJA named Young to its inaugural honor roll as an “Asian American Pioneer in U.S. journalism.” He is a past president of AAJA’s Washington, D.C. chapter. Retiring in 2013 from the Boston Globe, Young taught Foundations of Journalism at Emerson College. In October 1976, the New York Giants opened the original Giant Stadium at the Meadowlands in East Rutherford, N.J. At the time, I was covering the NFL for the New Haven Register, the second-largest metropolitan daily newspaper in Connecticut. 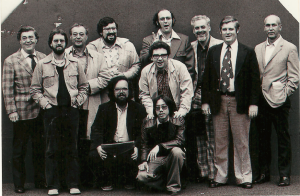 A few days before the inaugural game against the Dallas Cowboys, all the local beat writers gathered to take a photo on Media Day. There were 11 of us. Nobody gave it a second thought that I was the only Asian. In fact, nobody even noticed or cared there were no women, African Americans, Latinos or anyone else of color in the photo. Back then, I was THE exception rather than the rule. Forget Asians in mainstream newsrooms or professional press boxes. There weren’t any notable Asians doing anything in sports when I was a kid. I grew up in Westchester County, a suburb of New York, less than 20 minutes from Yankee Stadium. My parents owned the only Chinese restaurant in a town that was predominantly white. Like many traditional Asian families, my parents wanted me to go to a good college and get a good, respectable job. They were hoping that one day I would be a) a doctor b) a lawyer c) an engineer… but I chose d) none of the above. You’ve probably heard when it comes to education, studies have shown that 4 out of 5 Asian kids excel in math and science in school. Well, I was that 5th kid. Math and science were Greek to me. Instead, I developed an interest in sports. After school, I would bide my time at my parents’ restaurant, reading the sports sections of the New York Daily News and the now defunct New York Daily Mirror. I especially loved reading about the Yankees. While there were no Asian sports role models when I was growing up in the ‘50s and ‘60s, I had an uncle – the late Archie Haw – who was a big sports fan and bachelor who’d come over to our house on Saturdays during baseball season to watch the Yankees on TV and enjoy one of my mom’s home-cooked meals. In fact, it was Uncle Archie, who took me to my first Yankee game when I was 9 or 10. My uncle took me to more games, including the New York football Giants, and the seed was planted. By the time I got to high school, where I played three sports (soccer, basketball and baseball) and was the sports editor of the school newspaper, I knew what I wanted to do for the rest of my life, even if I didn’t know or see anybody else who looked like me doing it. I wanted to be a sportswriter. I eventually went to journalism school in Connecticut at the University of Bridgeport, was the sports editor of the school paper, interned in the school’s Sports Information Department, and wound up getting my first sportswriting job at the Bridgeport Post-Telegram after graduation. That was the start of a daily newspaper career that spanned more than four decades as an editor and writer at five publications, including USA Today, the New York Daily News and the Boston Globe. 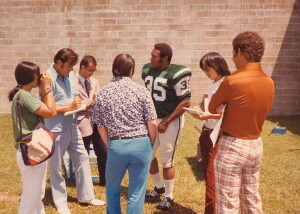 The sports journalism landscape has come a long way since that photo at Giants Stadium in ’76 and when I st arted in the business, where newspapers, magazines, TV and radio were the ONLY media outlets. Computers, the Internet and smartphones were still light years away. And it’s all changed for the better. That was never more evident than last August, when I attended the initial AAJA Sports Task Force workshop at AAJA’s National Convention in Washington, D.C. As I looked around the crowded SRO room, I was amazed and elated to see so many Asian American faces I recognized who held prominent roles in sports journalism today. Among them were a slew of colleagues from ESPN: producer Carolyn Hong, news editor Brian Wong, NBA dot.com writer Ohm Youngmisuk and SportsCenter anchor Kevin Negandhi. There was also Michael Kim, former ESPN anchor and now host of online venture 120 Sports; Michelle Yu, TV sportscaster; Leighton Ginn, Desert Sun sportswriter; and Sean Jensen, author and former NFL beat writer. The mission of the newly formed Task Force is to continue to elevate the voice of Asian Americans in sports and increase the ranks of Asian American sports journalists across multimedia platforms. I encourage all of you aspiring sports journalists to take advantage of the opportunities, resources and professional contacts the Sports Task Force offers in providing a network and support system to enhance your career. Looking back, I wish these kind of opportunities came knocking when I was starting out. I would’ve tried to take advantage of each and every one. But now is the chance to make the most of yours. STF promotes diversity within the sports industry through its community of dedicated media professionals by providing training and networking opportunities to its students and professional members. We offer scholarships, networking events and mentorship programs amongst other professional online and digital training programs. STF forges relationships amongst the leading AAPI professionals in the media community with students and entry-level professionals seeking to get established in their area of expertise. How long have you been involved in this industry? Copyright © 2019. AAJA Sports Task Force. All Rights Reserved. All other right reside with their respective companies.